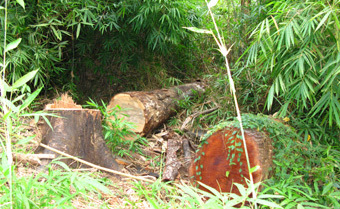 Probably the greatest threats to the park are agricultural encroachment, poaching and illegal logging. In a IUCN survey, reported by the BBC, large numbers of mammals Word-wide, but especially Asian primates, are at risk of extinction, with the biggest threat being loss of habitat, including deforestation. The WWF has stated that more than 1,000 species new to science, including mammals, reptiles and invertebrates, have been recorded in South-East Asia's Greater Mekong region over the past decade, but are now under threat. Find the Park on Google Earth (go to: 11°25'24"N 107°25'43"E) and you will be able to make out the two halves of the park as "islands of green" in an increasingly denuded landscape. To the south-west, Nam Cat Tien is contiguous with the Dong Nai Culture and Nature Reserve, thus providing an uninterupted range for wildlife - especially larger mammals. 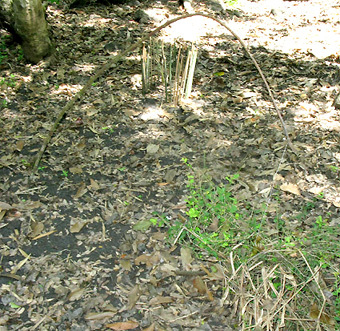 Keeping waterways clean is just one of the essential environmental services that tropical forests provide. 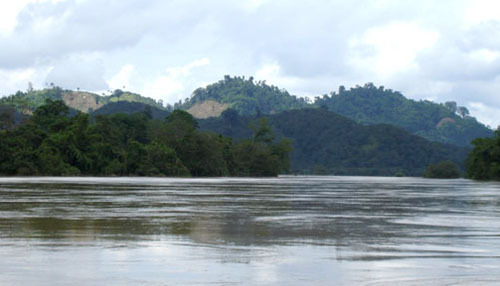 The Dong Nai river also serves as a moat: that helps to protect the Park from poachers and illegal loggers. ... protecting the land by contributing to its value is therefore the most viable solution: and must involve the local people to bring this about. Supported by the World Wildlife Fund (WWF), projects include surveying the small population of Javan rhinoceros - a 'flagship activity', widely associated with the park. However, this is only a small part of Cat Tien's story: conservation of the whole forest habitat must be the overall goal. The greater Cat Tien park is home to about 40 IUCN Red List species, and probably helps to protects around 30% of Vietnam's rarest organisms. sustainably stimulate the local economy. 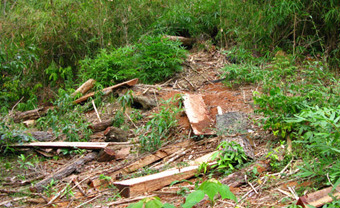 Addressing the agricultural needs of the local population, in a sustainable way rather than the use of destructive techniques such as shifting cultivation, will be crucial for maintaining biodiversity in the region. 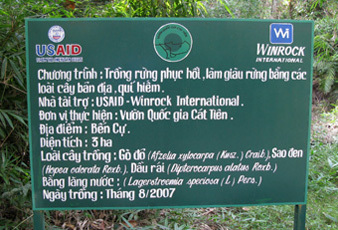 One of the more obvious pressures on the land is agriculture in the surrounding areas and the Ministry of Agriculture and Rural Development (MARD), supported by a number of International Organisations such as Winrock International and the WWF, strongly encourage sustainable agricultural development. 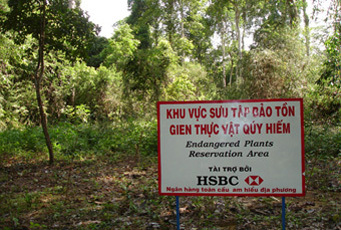 An EU sponsored project supported the planting of a 200 ha stand of native hardwood trees to the north of Talai (right). 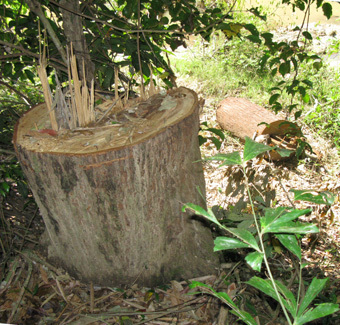 Members of this project studied the difficulties of establishing Dipterocarp forest on denuded area; cost are high because of the high mortality rate of species planted directly under sunshine. 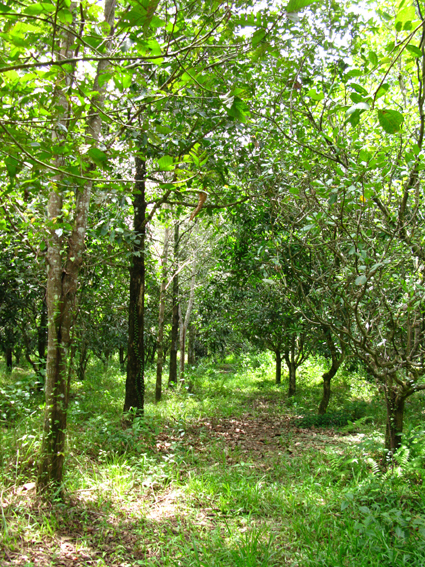 Nam Cat Tien JSC is supporting a scheme to provide medium-term income, by combining cash crops and other activities with further native hardwood tree planting and control of pests and invasive species.